Continuing on the series of the first tier of Warlords raiding, I don’t know what game tier it is now, tier 17? It’s hard to keep track. Regardless, while we assaulted the allies of the Iron Horde in the previous raid and got rid of Cho’gall and whatever his master used him as a pawn for, we’re now heading toward the seat of siege production itself, the Blackrock Foundry. 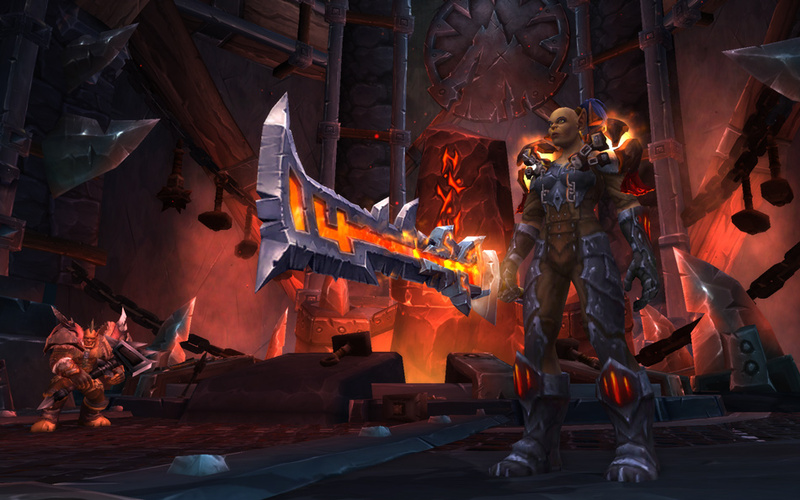 There are two reasons we’re entering Blackrock Foundry. Firstly, it’s the next stage of the legendary storyline where Khadgar sends us to collect certain reagents to break the mind control Gul’dan has over Garona Halforcen, the orc responsible for nearly assassinating Khadgar. We’re sent to collect 3 Elemental Tablets so that Khadgar can unlock the secrets of earth and fire to further enhance our rings. But more importantly for the chase for Gul’dan, we have to collect the Heart of the Fury from the Blast Furnace, Flamebender Ka’graz’s tome and to retrieve the lost Draenic Thaumaturgical Orb from the Iron Maidens. Ultimately, we’re here to put down Blackhand, warlord of the Blackrock clan and to halt the Iron March and production of their siege weaponry. In our timeline he’s known as the Dragonkiller. With a lack of dragons in this version of Draenor, he’s simply known as the father of the Gronn. Garrosh knew of his and the gronn’s might and enlisted the Thunderlord clan to subjugate and capture him for menial labour within the Foundry. His hand has been replaced by a hook in order to haul massive crates around the Slagworks though he does still keep his signature ability from Gruul’s Lair in Burning Crusade. Slaying Gruul will not only halt the Iron Horde’s production line, but it will also set some brute strength back from them and possibly dampen the spirits of any other gronn under subjugation of the Iron Horde. The Goren appear to be the pest of Draenor, much like the Virmen were in Mists, so it makes sense that we’d see a boss for one sooner or later. 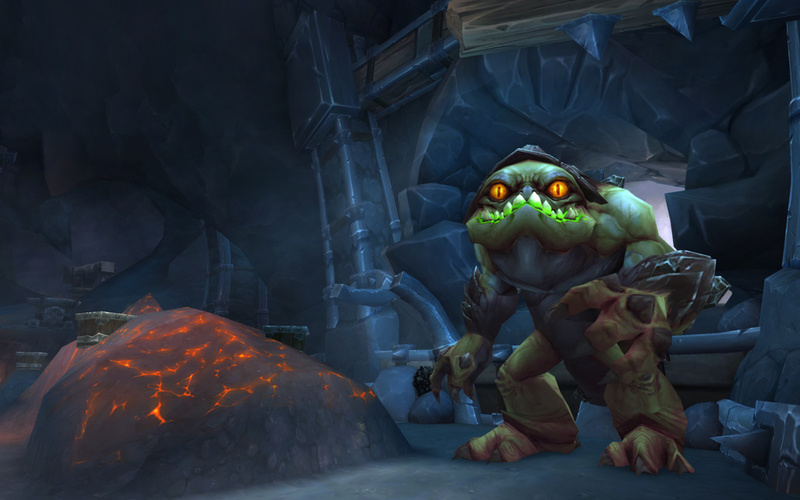 In our assault of the slagworks it seems that the goren have taken fancy to all of the blackrock ore littering the mines. Oregorger is a particularly big one thanks to his gluttony, and after we clear out the orcs in the area he immediately jumps down from the roof, ready to devour all of the blackrock ore deposits in the repository. The final encounter in the Slagworks wing is a notable increase in difficulty in comparison to the other two bosses, and thematically it feels a little bit out of place in this wing, where it might be better off within the Black Forge. Nevertheless, if the storage for the Blackrock ore is nearby and they usually have Gruul to haul the metals to the Black Forge to be made into weaponry and plating, I guess I could allow for a bit of bad planning from the simple minds of orcs. Players are here to destroy the furnace and cut off the production of the Blackrock Iron to the rest of Grommash’s Horde. First, we disable the heat regulators and fight off the orcs and ogron that are keeping us and the furnace in check. Once the regulators are blown, the Heart of the Mountain emerges from the furnace and more orcs arrive to keep it in check. As bits of slag animate and focus on raiders, the explosion caused by their demise is strong enough to interrupt the focus the elementalist orcs have on their shields. Once all of these elementalists go down, the Heart of the Mountain is unleashed, and he’s not too happy about being held hostage inside a furnace and strikes out at the players. We then kill him and the blast furnace is shut down, suppressing most of the Foundry’s production there and then. In addition, Khadgar asks players to take the Heart of the Fury from the Heart of the Mountain to aid in his efforts to free Garona from her mind control that Gul’dan placed upon her. Making our way into the Black Forge to shut down the next stage of Iron Horde arms production, we get into the Slagmill Press and are met by twins Hans’gar and Franzok. Originally exiled from their clan for not taking part in mak’gora against one another (a duel to the death to assume leadership), they were still incredibly skilled warriors. Being banished to the wilds of Draenor did nothing but improve their skills as brawlers and warriors, and increased their intuition between each other’s actions. 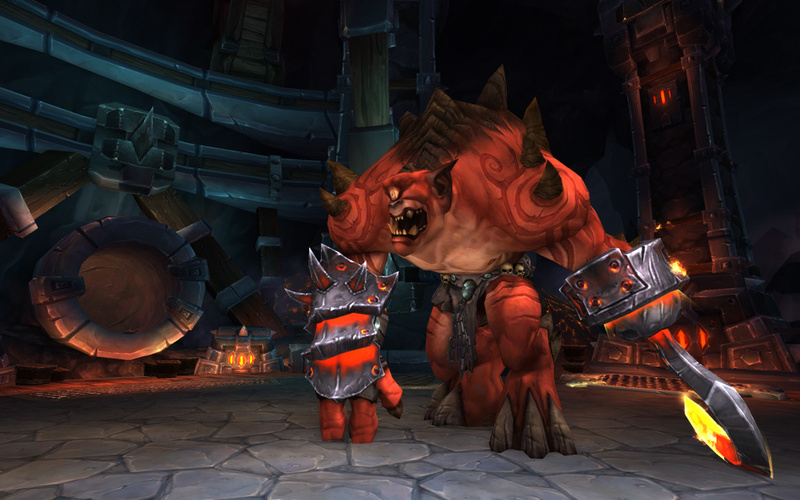 When the call of the Iron Horde came, they quickly took up arms and followed Blackhand’s command into the Foundry, where they work as overseers within the Slagmill. Although jammed by the time we get into the room, getting rid of these overseers is just another step in our murderous rampage through the Foundry to deal a heavy blow to the Iron Horde. Revered shaman of the Burning Blade clan, Flamebender Ka’graz resides within the Black Forge to aid the Iron Horde in creating and imbuing blades with the primal fury of her clan’s namesake. Alongside Aknor Steelbringer (who if you don’t kill for the achievement – doesn’t appear to enjoy spending the rest of his life at the forge) they toil before an ever-burning forge in support of the Iron Horde’s conquest of Draenor and beyond. The final encounter we meet within the Black Forge resides in the Great Anvil, and was a peculiar sight to behold. The orcs dug too deep in their excavation for Blackrock Ore, and wakened a slumbering magnaron named Kromog when they uncovered his chamber. To their even greater surprise, the magnaron decided to aid the orcs in their endeavours and uses his massive fists to pound and hammer out gigantic plates used in Iron Horde dreadnaughts and siege machinery. Why he’s annoyed when we walk into the room however is a mystery. Perhaps he realised that the Iron Horde are in fact a terrible employer and he gets no benefits and very little holiday entitlement, and he thinks we’re more taskmasters sent to ask for his quarterly reports. There’s a reason why there’s no Iron Horde around the area once you leave the Black Forge area! Ultimately, he’s definitely a filler boss story-wise, but he’s a fun fight nevertheless!